The Vietnam Chamber of Commerce and Industry (VCCI) and 21 central and northern provinces signed an agreement on September 22 in Hanoi to jointly create a favorable business environment. With this agreement, all provinces and cities nationwide have so far committed to facilitating business activities as requested in Government Resolution No. 35 on enterprise development until 2020. Their commitments include basic commitments and other commitments. Specifically, for basic ones, all provinces pledge to direct local departments, management boards and sectors and district-level People’s Committees not to criminalize economic and civil relations. They also agree to regularly organize public dialogues between authorities and enterprises and the press while setting up hotlines and publicizing online queries on their e-portals to receive opinions and answer questions of enterprises. Also stated in the commitments, cadres and civil servants of provinces will thoroughly grasp the professional code of ethics, actively participate in administrative reforms, combat bureaucracy, corruption and authoritarianism, and bear in mind that local authorities cannot but serve and support enterprises. The provinces commit to publicizing the process and cadres in charge of settling dossiers, increasing the inspection of public duty performance, and strictly handling cadres that cause troubles to enterprises during the process of dossier settlement. Heads of agencies and units must take responsibility for violations of civil servants and public employees under their management. Regarding other commitments, each locality has put forth its specific numbers for achieving some objectives of simplifying administrative formalities or developing enterprises, depending on its practical conditions. 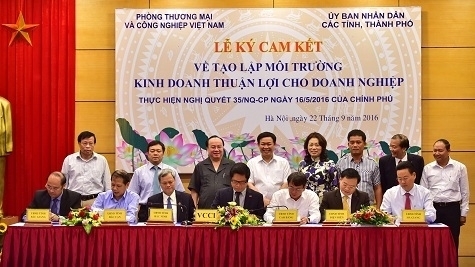 Specifically, Hai Duong province pledges to cut down 50-60 percent of the time required for settling administrative formalities on investment under the competence of its provincial-level People’s Committee while Nghe An province commits to settle online enterprise registration dossiers within two working days, among others.